It is Strawberry Season! We are very fortunate to have a family connection to the Crane Berry Farm in Chassell. The children love to help us with the berries. They help to wash them and to cut them for freezing or baking. One of my little friends just can't get enough when it comes to cutting berries. She has been cutting, and cutting, and cutting. 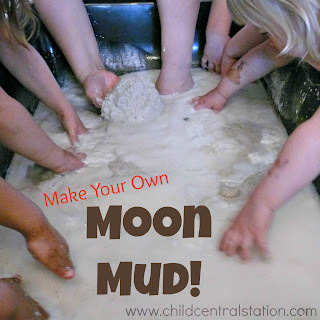 This is real work for little hands. Armed with a cutting board and a butter knife she has been cutting off the "green parts" from the "red parts" or the stem from the berries. 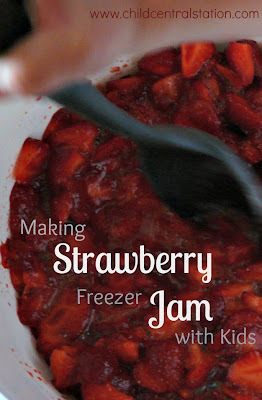 Today, we took the activity a bit further and made up a batch of strawberry freezer jam. We added 1 1/2 cups of sugar and one package of pectin. It is important to mix the sugar and the pectin well before adding the berries. In a separate bowl, we mashed our berries with a meat tenderizer. We like our jam to have big chunks of berries, so we only mashed them up a little bit. Then we added 6 heaping cups of berries to our pectin and sugar mixture. (I know that the recipe only calls for 4 cups, but I always push the limit with as many berries as possible!) Stir the mixture well, and then let it sit for a couple of minutes. The jam will begin to thicken. Then, scoop it into your freezer jars/containers. The jam will continue to set, but is ready to be placed into the freezer immediately. PB&Js always taste best with fresh jam that you helped to make yourself! We are also drying some of our strawberry slices in the dehydrator. What do you do with your strawberries? FREEZER JAM ALL THE WAY BABY!!!!!!!! and I have a set of sisters who always say everytime we have PB&J for meals that I ALWAYS make them best!!! can this be set in the refrigerator too? how long until it is set enough to ear?